Well presented throughout, this stunning two bedroom garden flat is finished to an excellent standard and boasts an expansive reception room, sleek open-plan kitchen and two generous sized bedrooms with en suites. 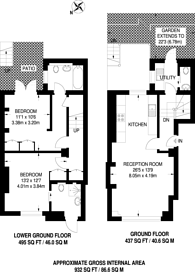 Leigh Street is ideally located just off Judd Street which offers local amenities. Euston Road and Southampton Row provides the property with a wider range of shops, bars and restaurants. Russell Square is also within easy reach.